This blog will share the journey of an Indie author. This path is small and narrow, very much like the veins of a leaf. Vivian Williams sat at her computer surrounded by her cats. Yes, she admitted that she was a closet cat lady with her two starter cats, Mime and Jester. They were her black and white tuxedo cats. The two were brothers and were similar in looks. 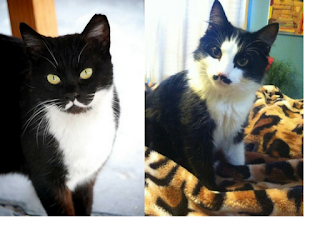 They both had little mustaches painted on their faces since birth. Jesters face was black with a white mustache and Mime’s face was white with a black mustache. Vivian almost named him Adolf but decided she did not want to think of Hitler every time she called out to him. Both cats were lounging on the chairs that filled the computer room/den. Was it unusual to have a den when you lived alone? She wasn’t sure so she called it a computer room, just in case. Vivian had been living alone since her divorce 16 years earlier. It was still a shock when she realized that so much time had passed. Oh well, she thought, it’s not like I am looking for someone. The last time she had left the house was several weeks back and that was to pick up some groceries, cat food and litter. The necessities of life as a closet cat lady. Maybe she would go out today, but perhaps not. She wasn’t willing to commit to that when she still had a pantry full of food and plenty of litter. Vivian loved being part of the blogosphere. Her best friends lived all over the world and she never had to leave the house or call them to find out what they were doing on any given day. Sometimes she even knew exactly what they were eating and drinking. Vivian wrote her own blog, The Intrepid Reader, where she wrote book reviews and short stories for fun. Reading and writing were the two things she had always wanted to do. Now she did it with fervor. Day in and day out, she sat at the computer, keyboard clacking away. This morning she typed in her favorite blogger’s page. Instead of a landing page with the familiar icons and images, she found the glaring words, 404 page not found. Julianne’s blog, Look at Me Now was where she religiously documented her weight loss and new life as a vegan. It had some interesting recipes even though Vivian was a complete carnivore. But where was her blog? Vivian typed it a second time and got the same results. Not Found! What did that even mean? Julianne would not just take down her blog. She had been building it for the last two years and it was her passion. Well… that and living the vegan lifestyle. Something was wrong, Vivian could just feel it. There was a mystery afoot! Vivian went to one of her favorite forums that both she and Julianne frequented. She put up a post, asking if anyone had heard from the blogger@lookatmenow.com. She did not want to put Julianne’s personal information out on the internet. That wasn’t her place and she did not want to jeopardize her friend’s safety. She just wanted some answers. As she waited for a notification to pop up on her screen or in her email, she concentrated very hard on Julianne. She visualized her profile picture and kept her eyes closed. A vision as clear as a bell came to her. Julianne was standing on a boat, a large boat. Perhaps it was even a ship. She could see her looking out over the Seattle shoreline. She recognized the Space Needle in the vision. A gentle ping sounded and it was just enough to draw Vivian back to her own surroundings. She looked down at her computer and saw a message icon. Clicking the icon she saw that she had a comment notification from her blog. She pulled up the site with bated breath hoping that the message was from Julianne. She blew out her breath in a low whistle that made Jester and Mime’s ears twitch. “Sorry guys” she called out before looking back at the message. It had taken its time loading and she was excited to see who had left a response. Once the screen fully loaded she could see that it was indeed a post from Julianne. She scrolled down the screen and read the carefully worded message. Did you get my email? J. “Email? I didn't see an email." She had checked her email inbox first as she always did. There were the usual 50 blogger notifications just as there was each morning. She once again went to the browser and pulled up her email account.Viv saw nothing from Julianne so she clicked the spam box, just to make sure. There, 4 spam emails down, just below the Nigerian King's offer to send her 5 million dollars, was her friend’s name. Vivian hurried to log into the forum and delete her panicked MIA post. She realized that she had spent the last 4 hours searching for someone who was not exactly missing. The rest of the day and well into the night Vivian searched all over the blogosphere for pages on telepathy. She read every post she found on the subject. Until it was time to shower and go to bed. 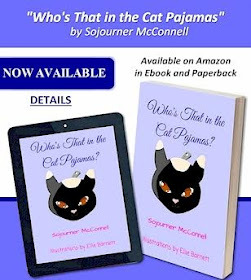 Preorder Your Copy of Who's That in the Cat Pajamas? Something completely awesome in the house this week! April 1st Campers Arrive, Unload the Laptop! Camp NaNoWriMo, are you joining in? Mentoring about a Book Signing Needed!